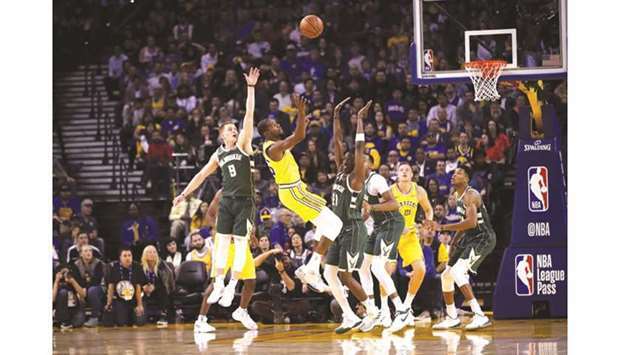 The Milwaukee Bucks made a statement on Thursday night with a 134-111 victory over the Golden State Warriors, snapping the two-time defending champions’ eight-game NBA winning streak. The ever-improving Bucks imposed their will on a Warriors team that was without injured Draymond Green and lost Stephen Curry to a left adductor strain in the third quarter. Milwaukee’s Eric Bledsoe led all scorers with 26 points — 10 of them in the Bucks’ 41-point third quarter. Antetokounmpo, touted as Most Valuable Player material, added 24 points, nine rebounds and four assists. The Bucks out-scored the Warriors 84-34 in the paint and led the Warriors 20-4 in fast-break points. Milwaukee parlayed 18 Warriors turnovers into 23 points and led by as many as 29 in the second half as they dealt the Warriors their first home defeat of the season. Curry was trying to contest a Bledsoe shot in the third when he clutched his thigh in pain. Warriors coach Steve Kerr said he’d have an MRI exam. Curry scored 10 points before he departed — his second straight game with fewer than 20. 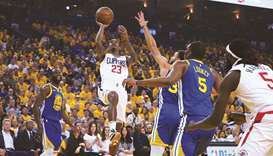 “Sometimes you’ve got to get hit in the mouth in this league to remind you how hard it is to win a game,” Kerr said, adding that Green’s absence wasn’t the Warriors’ biggest problem. “When you come out with a sort of mindless intent, and you’re fouling and not executing, just taking quick shots against a really good team — a team that’s hungry and on the rise — you’re not going to fare very well,” he said. Paul George scored 20 points to lead the Oklahoma City Thunder to a seventh straight victory, a dominant 98-80 home triumph over the Houston Rockets. Thunder point guard Russell Westbrook missed his second straight game with a sprained left ankle, but with Westbrook offering advice and energy from the bench Oklahoma City didn’t miss a beat. New Zealander Steven Adams had 19 points and 10 rebounds for the Thunder. Terrance Ferguson and Dennis Schroder added 14 points apiece as all five Thunder starters and substitute Raymond Felton scored in double figures. James Harden led the Rockets with 19 points but connected on just seven of 19 shots from the field. Clint Capela added 17 for the Rockets, who saw a three-game winning streak snapped. Carmelo Anthony, who played for the Thunder last season before being traded to the Rockets, epitomized Houston’s woes as he endured a nightmare return to Oklahoma City. He scored two points — making one of his 11 shots as the Rockets, who led the league with 65 wins last season, fell to 4-6. In Phoenix, the Boston Celtics rallied from a 22-point third-quarter deficit to hand the Suns a heartbreaking 116-109 overtime defeat. Kyrie Irving scored 18 of his 39 points in the fourth quarter and overtime for Boston and Marcus Morris added 17 points against his former team. That included a three-pointer with 1.1 seconds remaining in regulation that knotted the score at 100-100. Jaylen Brown’s 17 points all came after halftime as the Celtics snapped a two-game losing streak. The Suns, meanwhile, have lost nine of 10 in the young season.